Steph's Endurance: What a birthday! 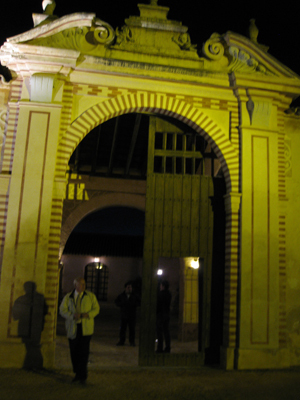 In an old hacienda, built in 1689 - originally constructed as a mill for producing olive oil, now a historic building of Seville - high adobe ceilings and huge wooden doors, tables loaded with tapas, vino - lambrusco, vino tinto, vino blanco, champagne - muscatel, beautiful spanish people serving food and more food and wine and more wine. and before the evening is over the lights dim and a cake is brought in, and people singing Happy Birthday - and Jose Manuel Soto (one of Spain's famous singers!!!) singing Happy Birthday... and the television camera rolling. OMG you never know what life will give you! !